Suzane- decorative picture, embroidered in silk or cotton. 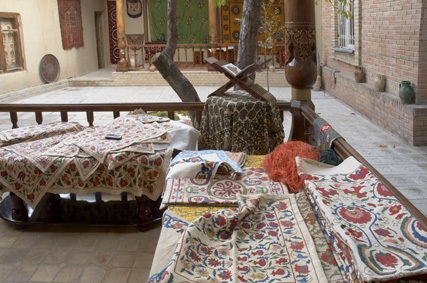 For many centuries different schools were formed in the art of suzane embroidery: Nurata, Bukhara, Samarkand, Urgut, Shakhrisabz, Tashkent and Fergana schools. Each school differs by its peculiarities of embroidery and original colours. surrounding nature – pictures of trees, flowering shrubs, different flowers: pinks, tulips, peonies, chrysanthemums and others. Bukhara suzane is truly considered as the most beautiful suzane in Central Asia. Samarkand embroidery dates back to the art of ancient Sogdiana. Samarkand handicrafts unlike Nurata and Bukhara, have bigger and laconic details of the design. At the same time the accuracy of the design is important. The main Samarkand motive is a round rosace of crimson tones, which is surrounded by the deciduous ring. embroidered in “bosma” seam on white cotton cloth, rare on crimson or yellow silk. Blue, yellow stylish patterns in the form of flowers symbolize the sun. Sometimes motives of different home subjects, such as tea pots, drinking bowls, may be founded in the ornaments of suzane. Large, dense embroidery on suzane from Urgut almost covers the surface of the handicraft. The large medallion is placed on Shakhrisabz handicrafts, and the quarters of the same medallions are placed in the corners. The medallions have the geometrical ornament and saturated polychromatic colours. Expressive embroideries of Shakhrisabz, made on the color background by a tambour stitch, are very interesting. The embroidery of Tashkent mistresses has a peculiar style. 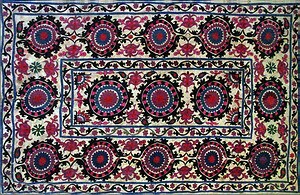 There are two types of large decorativeеmbroideries – palyak and gulkurpa. The main motives of palyak are big mulberry rings, which closely fill the surface of the cloth. 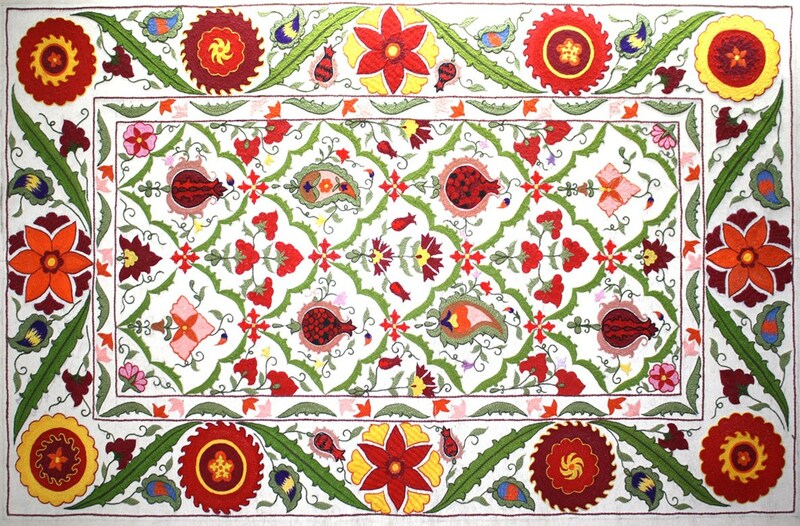 Gulkurpa (flower quilt) is decorated by the plant ornament. The motives of the stylized stars, sun, flowers are in the ornament of both palyak and gulkurpa. The handcrafts of Fergana school are usually made on dark green or purple silk or satin, and they are notable for a light pattern. The round rosace of concentric rings was the abundant motif of the majority of big embroideries.